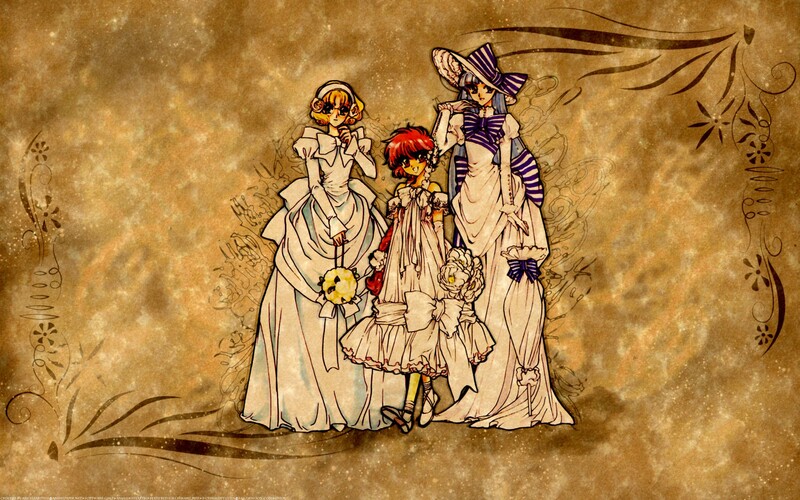 This is a wallpaper of the 3 Magic Knights in Victorian looking clothes. I found the scan at Animepaper.net and modified a few of the dresses. This was to be a simple wallpaper that ended up being a little more work then I had expected but it turned out nicely. I used brushes and textures and such to create it to be like an old photo. So, I hope you like it! ENJOY! very very nice, good job! i really like this comic when i was a child! Wow! This turned out really well! The dress that Umi is wearing looks similar to Eliza Doolittle's Derby Day dress that Audrey Hepburn wears in "My Fair Lady" (although it is blue here - rather than purple). The border designs are very nice. oh wow, I've never seen these scans before they're not in the art books I have, are they anime scans? Or did you modifie the dresses a lot? I still like the old feel and boders, I love Umi's dress... fav from me. oye esta imagen esta fantastica! this is beautiful and breathtaking truly love it! Wow! you did it very very good! I like it!